Postsecondary education governance structures were adopted in order to best serve each state’s higher education institutions, and for that reason, no two are exactly the same. Many states are split between having a single or multiple statewide coordinating boards, agencies, or governing boards to fulfill their postsecondary education needs. Governance structures in each state are also divided by their scope of authority, primary responsibilities, and more. 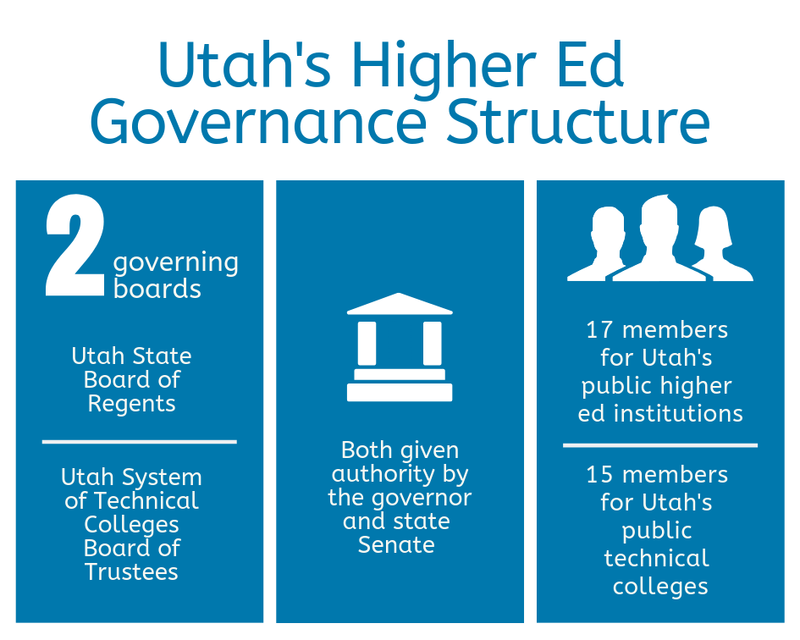 Utah currently has two postsecondary governing boards—the Utah State Board of Regents and the Utah System of Technical Colleges Board of Trustees. The Board of Regents oversees all public two-year and four-year colleges and universities in the state (collectively known as the Utah System of Higher Education), while the UTECH Board of Trustees oversees all public two-year technical colleges in the state. Both boards have authority given by the governor and Senate in their respective systems and have the ability to approve and recommend budgetary items for institutions. The Board of Regents, however, has a limited academic program role, where the UTECH Board of Trustees has the ability to review and approve new programs. The Board of Regents is comprised of 17 Utah citizens, all appointed by the governor—eight at-large, eight previous institutional trustees (with representation from each USHE institution), and one student regent. Compared to other states, Utah is among Arizona, California, North Carolina, Vermont, and others who don’t have a single statewide coordinating board, agency, or governing board, for a total of 22 states including the District of Columbia. States like Alabama, Texas, Wisconsin, New York, and others have a single statewide coordinating board, agency, or governing board, for a total of 29 states. Utah has among the lowest number of state postsecondary education governance entities. The lowest is Delaware with only one entity and the highest is Texas with 13 entities. The majority of states, including Utah and the District of Columbia, have governing postsecondary education structures. Only Montana, Oregon, Kansas, West Virginia, New Jersey, and Delaware do not have governing or purely governing structures. See more information on how other states compare.